When it comes to scaling up and acquiring customers, letting your customers do it for you is by far the most popular way to do it. Word of Mouth: Friends tell friends. Think friends recommending Google. Incentivized Word of Mouth: Friends tell friends because one (or both) of the friends gets something out of it. Think Uber’s referral program. Demonstrable Value: Seeing someone order their Starbucks Frappuccino with their app and waltz past a line makes you want that bad. Infectious: The nature of how you use a product helps it spread. For example, sharing a YouTube video with someone helps it take off. Outbreak: Product just spreads because it’s created a wave, like Pokemòn Go. Referral programs fall under the second category – incentivized Word-of-Mouth. Nearly every major B2C tech company has leveraged them to some extent. This article will dive in to how they do it…and how other companies can try to replicate that success. Better targeting People know their network a whole lot better than you do. When you have something great, you want to share with friends that will find it awesome as well. If they have a relevant friend, they can target your perfect user for you. Ideally, they’re providing value to their friends to be good friends; any bonus is just an add-on for them. The Perfect Customer According to a University of Pennsylvania and Goethe University Frankfurt study, referred customers are have have higher retention rates and revenue than average customers. Increased Awareness and Conversions A good referral program gets your product in front of people you could never reach in the past. I’m an obsessive Product Hunter – on a nearly daily basis, I pass on recommendations to friends. Click on the comments on any Facebook Ad – you’ll see that at least some people are tagging their friends. Compounded Growth Effect If enough new customers are referring their friends, you can rapidly reach the type of viral coefficient that brings exponential growth. Bridge the Credibility Chasm Every startup has a list of press coverage on their website. Or a quote from a thrilled user. But with so many surrounding us, we start to lose faith in their credibility. A quality Word of Mouth lead is the best way to bridge that – a 2012 Nielsen study found that 92% of consumers trust earned media (like recommendations and WOM) over any other form of advertising. The Product Without a great product, referrals are not likely to be forthcoming. Friends don’t refer friends to crap. The Advocate Who will be allowed to function as an advocate? Paying users? Registered users? Prospects? Anyone? Incentivize the advocate Typeform gives you 10% off for every referral that signs up. Incentivize both For example, Google Apps provided credit to both the advocate and the referred party after signups. The Ask In order for the referral to count, the referred friend needs to be asked to complete a defined action – signup, sign-in or order. Sometimes multiple Asks are required, like Evernote requiring users to refer three users before providing the carrot. The Share Helping the user share the program – by providing suggested copy, accessible sharing channels and shareable links – can push them to get the word out. The Report Most programs will enable users to track their own progress. Many platforms now combine this with gamification techniques. Every referral program needs to begin with your KPI. What are you looking to accomplish and what are you willing to spend to make it happen? Cost of Carrot – If you’re qualifying the Carrot on an actual purchase and this is under your net profit (or if you’re banking on ongoing revenue from a repeat user), this should be easy to accommodate. Platform Cost – While some light-weight programs exist that cost $30-$50/month, many referral platforms can run $400-$500/month, creating significant overhead. Operations Cost – How long will this take you to design, implement and maintain? Research Makes Perfect Are you getting organic referrals without pushing any program? Why are people referring you? How do they describe you to their friends? Research will validate that you have a referral-worthy product and an appreciative audience before you waste time and money getting started. Start Slow Get started with a home-grown Zapier referral program, where you ask a small sample size of your user base to BCC an email address during referrals and automatically add them to an Excel spreadsheet. It’s practically free and will give you a baseline for how receptive your userbase is. Altruism Works The first iteration of Airbnb’s program gave money to the referred user, not the friend. Sometimes altruism and the feeling of helping a friend out by sharing something you like can speak louder than a $10 referral fee. Data Works Use a growth framework that can track progress through a funnel so that you can optimize every step. Spread the Word Give your referrers the tools they need to spread the word. Emails are so 90’s (but, yes, they still work well). Empower referrers to tell their friends about your product using the same channels they would normally use talk to their friends, like WhatsApp or Facebook Messenger. Of course, being the first to a specific channel can be a huge edge. Leverage Influencers If you’re proud of the referral program and want to make it work, pump it out everywhere. Use influencers to push it out too – one Chinese Airbnb user bought in hundreds of bookings in the program’s first month. Gamification Throw in a progress bar to push people to a specific referral limit. Opentest’s Openvid referral program has a list of features to unlock as you refer more friends; there’s a very human drive to keep on crossing them off the list. Get Specific Referral programs can cost money. Make sure that your ask is success-oriented enough to make it ROI positive – just requesting signups for a paid SaaS platform could leave you in the lurch. One way to ensure this is by making the ask very specific. For example, Evernote’s program requires a sign-in, not just a sign-up, while Amazon Prime’s referral program requires the referred user to spend $5. Moment of Glory Chances are that your SaaS product provides value at a very specific point. Amazon’s moment of glory is when you get your product. Mailchimp is when you send your email. Ask for the referral when your customers are thrilled with your service. Nearly 85% of customers are happy to provide a referral but only 30% do. A delighted customer is your best referral target. For example, if your support team just had a great conversation, have them end it with the link. You won’t regret it. Go Off Platform Keeping your customers throughout the lifecycle is the best way to push for a referral. Referral programs can sometimes feel transactional but if you were ever delighted by a company, you know that you referral them because you love them, not because you care about the $15 dollar discount. Unbounce once gave me a t-shirt when they had one stupid glitch. I’ve been referring them to everyone I know since. Get Exclusive Nothing evokes a response like getting on a list to a secret party. Letting your user feel like an insider – or better yet the Big Man on Campus that’s hooking his friends up with a favor – is a great way to push WOM referrals. This was one of the secret’s to Gmail demand generation in the early days. 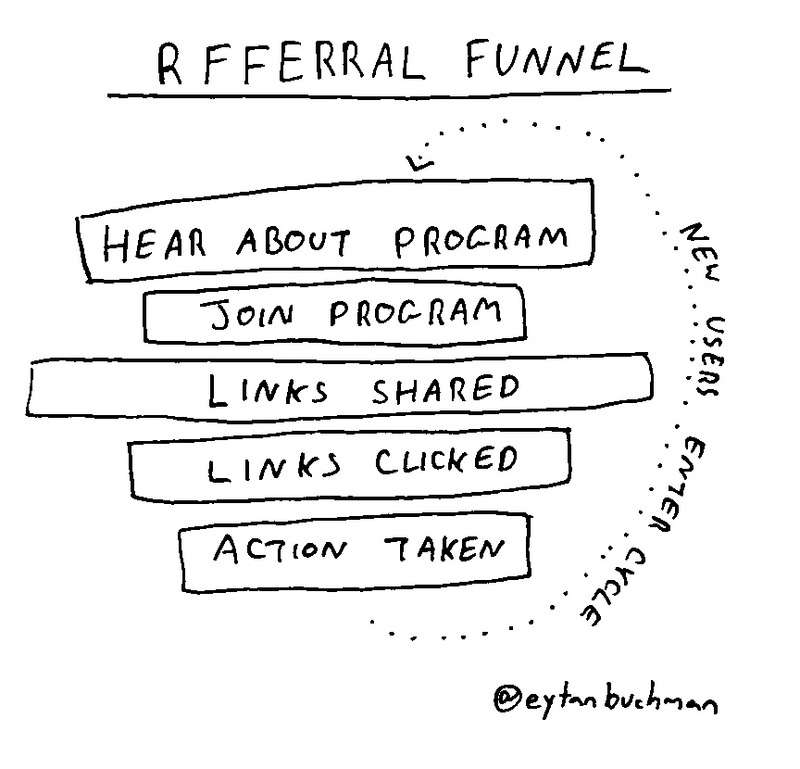 Transactional Sometimes pushing a referral program makes it feel too transactional. A natural brand ambassador who tells every friend about your product could be turned off by feeling like you’re buying his loyalty. Not a Bandaid for Quality If your product isn’t referral-worthy, no amount of referral marketing efforts will save you. B2B vs B2C I’ve yet to see a very effective successes of referral marketing in the B2B space. Dropbox (Dropbox CEO Drew Houston’s public case study) Inspired by PayPal $5 bonus to create two-sided incentive program that increased signups by 60%. Within 30 days, users sent 2.8 million referral links, pushing Dropbox from 100k to 4m users in 15 months. 35% of those signups came from the referral programs, while another 20% came from other viral [features. Airbnb Public Case Study Putting real effort (3 full months from 5 people), Airbnb used automated contact list imports, influencers and aggressive referral promotion, offering $25 credit for new users. Paypal’s Growth to 100,000 Users Paypal sunk $60-$70 million dollars into a referral program that would pay $20 to a user when they registered and continue to pay out another $20 every time a new referral signed up. The result was 100,000 users signing up in one month alone. Because everyone likes money. Made by me. Updated in 2018.